Our programmes and teaching focus on holistic spirituality, shamanic healing, multidimensional awareness and areas of self-empowerment, identifying and supporting clear intentions and what truly motivates each participant, in an environment based on safety and mutual respect. This provides sound foundations for exploring deep dynamics, healing blocks and restoring fragmented parts. Our work may involve experiencing expanded states of consciousness and our primary aim is their constructive integration into everyday life. Our programmes cover a wide spectrum of modalities, including workshops, consultations, residential and distant training, retreats, mentoring services, correspondence and self-study courses, etc. We employ simple and effective tools to support transformation, clarity of intent and mastery of one’s creative and spiritual potential, adapting the work to each individual and group. We offer programmes suited to a wide range of interests, people and countries. New workshops are regularly being developed to meet specific needs. Our understanding is that everyone has specific requirements, purposes and priorities. In our programmes the basic belief is that the leading training occurs between each seeker and their spiritual guides or inner realms. Our primary aim and commitment is to support, encourage and guide this process. Our programmes are empowering, nurturing, pragmatic, supportive, caring and well-organised. They are set up for small groups and single individuals, personalised according to their needs and visions, including self-study literature, personal mentoring and supervised practices. We can work with you distantly or in the centres and countries where we operate. We can easily organise a programme for you on request in most times of the year. Working with us usually starts by taking an individual session or one of our basic workshops. Then, based on their experiences and visions, it is up to the participants to decide if or when it is right to continue with further work or courses. If you are interested in our work a first step we suggest is to contact us and arrange an appointment (by Skype or phone) aimed at helping you to explore if our programmes are right for you and what format could be more useful in your current life path. Another option, as a starting step, is to have an individual session, which besides clarifying the above can also allow a first direct experience of the work. Our programmes have a cost, yet it is our policy that no one should ever be discouraged from attending because of financial difficulties. If you are unable to pay the full cost, you can receive a bursary and pay whatever you can. Our aim is to facilitate your connection with the multidimensional realms and spirit worlds, while supporting you in unfolding your life purpose and grounding it in everyday reality. Our workshops are aimed at providing tools to develop and support your own spiritual and shamanic path, and how you can effectively walk it in your daily life. They are not intended as therapy programmes. Our programmes may help you discovering and manifesting healing talents or other ways you can be of service to the world, yet they are not meant to teach you how to become a shaman or healer. This, as we see it, is a profound inner vocation, which requires deep integrity, adequate training and initiation primarily from the spirit world. For those who receive a calling to work at a more advanced level with us, including employing in the work with other people the astroshamanic and spiritual healing practices developed by the Institute, and becoming one of our certified practitioner or mentors, we may provide specific training. The Institute has developed its own techniques, workshops and programmes based on 35 years of experience. Whether you intend to join us in just one programme or attend our courses for a longer period of time, our Core Workshops provide a valuable learning and life experience, which can be precious to develop your own guidance and explore how you can best continue your journey. What follows is a list of our essential Core Workshops. Their duration ranges from two days to three weeks, and consist of Basic Workshops, usually lasting two or three days, Intermediary and Advanced Workshops, ranging from two days to one or three weeks. This classic introductory seminar is one of the best ways to explore and experience astroshamanism and holistic spirituality. During this workshop, participants are initiated to some of our core practices of astroshamanism. Particular attention is given to identify and develop tools allowing each participant to connect with their authentic life purpose and spiritual source of empowering guidance. We also acknowledge areas of darkness and grievances, and employ spiritual healing practices of release and forgiveness, which participants can learn and use also on their own. The Basic Workshop usually runs for two or three days with different formats according to the centre where it takes place. An optional Intermediary Workshop, also lasting two or three days, aimed at integrating the work and bringing it to a deeper level, may follow. Programmes are held in English, Italian, German, French, Spanish and Polish. After a basic workshop, the sequence of training is not fixed, and who wish to continue can move at different speeds according to their requirements and needs. We offer the Basic Workshop applied to all our Core Workshops focused on specific themes. Please find below some of them. During this workshop, participants are initiated to some of our astroshamanic core practices. The structure and content of the workshop change according to the themes and category of the programme, the seasonal cycles, the natural, cultural and human environment where the event takes place. The workshop usually includes our own astroshamanic or holistic spirituality practices integrated with tools from various spiritual traditions, elements of astrology, the use of the sacred circle, regular times for meditation, sharing and deep listening and the experience of the Basic Ritual of the Sacred Cone, one of the main practices devised by the Institute. In this workshop dance and sound are used as transformational tools to open the pathway to expanded states of consciousness and a profound awareness of our environment and us. We employ movement to animate deep emotions and stagnant energies, redirecting them to support our highest potentials, empowering our authentic visions and stepping into the healing flow that allows us to reshape the world within which we live. The programme includes a variety of tools, such as trance and ritual dances, astroshamanic chants and movements, planetary scales, drumming, healing postures and also stillness, meditation, giving space to dancer within. Astroshamanic dance aims at acknowledging, retrieving and integrating the lost pieces of our soul as represented by the 12 zodiac signs. Each signs has its own frequency and through dance we can align to its modalities of expression and incorporate them in our awareness. By physically dancing the sign, we enter into their rhythm, experiencing their energies and directing them toward a conscious intention. This workshop is for those who long to take a decisive leap into the discovery and manifestation of their unique potentials and authentic purpose, so as to provide benefits to themselves and the whole environment. The workshop also aims at showing how apparently insurmountable obstacles and crisis can be used to give shape to our most ambitious dreams. During our time together we will also unveil how in every moment of our life, dark times included, we are never alone and there are immense forces available to provide support. From the shamanic perspective human sufferance comes from soul fragmentation, which is the result of belief systems based on separation and the cause of all fears held in our culture, such as abandonment, rejection and ultimately death. During this workshop we will use healing tools for tracking and retrieving separated parts, releasing and transforming blocks, promoting harmonious connections. Participants will have the opportunity to learn a simple technique for identifying their Intent, dissipating unbalanced energies, and receiving guidance and support. The aim of the workshop is to connect personal issues with collective processes, uncovering the inter-relatedness of all existence and true healing potentials both in our individual and collective reality. The programme includes shamanic journeys and rituals, elements of soul retrieval and astroshamanic touch, circle release work and trance postures. Duration: two to five days. Relationships are the most fruitful grounds for holistic healing and spiritual growth. Despite their grievances and turbulence, they exemplify human collective wounds longing to be released and transformed into unconditional love and joy. This workshop explores relationships from a holistic and shamanic perspective with the aim of healing connections with partners, relatives, friends and significant people in one’s life. We will track and release blocks to our capacity to love, identifying the underlying issues that hamper relationships, promoting healing, fulfilment and peace. The workshop is designed for all types of relationships, encompassing couples in intimate or platonic connections, partnerships in work or service, rapports with friends and relatives, celibate life and chastity. Duration: two days to one week. Learn how to use spiritual practice in order to clarify your purpose and manifest ‘right living’. We explore your unique way of opening to spiritual guidance to unveil your potential and bring benefit to yourself, your relationships and the planet. We integrate various spiritual healing practices with practical work and release disturbing patterns, converting them into energy to support our goals. Duration: two days to one week. Who is God to us? Do we feel embarrassed or disturbed to use this word? How does the God of our early education relate to our present experience? Is this a loving or a judging God? What are the related blessings and wounds? This workshop aims at exploring our connection with God from a shamanic and holistic perspective, discriminating between direct experience and religious conditionings. The workshop is a wide-ranging journey, encompassing a tapestry of shamanic practices from the Christian tradition, with elements of Gnosticism, esoteric astrology and A Course in Miracles. Whether we consider or ignore them, the Judo-Christian traditions shape the matrix of our contemporary culture. The workshop is ideal for those wishing to heal, restore or deepen their relationship with God, facing and releasing unresolved grievances with their early religious roots, while also opening up to their blessings and ecstatic mysteries. Duration: two days to one week. This classic programme is aimed at offering practical tools and understanding for navigating beyond conventional time and space or, in other words, for experientially diving into the mystery of death, birth, past and future lives, and magnifying the reality of the present. The purpose is that of linking personal life to planetary and mythic history, exploring archaic roots and advanced lineages, connecting with significant locations, retrieving lost parts, facing death-life passageways, releasing and transforming grievances, uncovering luminous intentions, bringing healing in the local and global environment. The environment where the workshop takes place is transformed into an astrological circle, with areas indicating each sign of the zodiac, using various creative possibilities (stones, art works, huts, flags, signboards, etc.). Participants are involved in the creation of an Astroshamanic Healing Grid. The programme includes soul retrieval, shamanic time voyages, trance dance, recapitulation, and connection with nature spirits, and tools to unveil our hidden human potentials. In this workshop we discover ways of employing our body to foster expanded states of consciousness, bridging our physical and multidimensional nature. Through movements, dance, prayer, meditation, soul retrieval and physical contact, we receive visions and insights, redeploying energy and passion in accordance with one's life purpose and the web of life. We also explore our shadow; sharing ways to explore denied and hidden parts of ourselves, release intense feelings, promoting forgiveness, transformation and unconditional love. 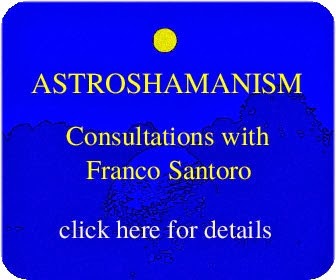 The programme is a full introduction to Astroshamanic Touch, a bodywork application of Astroshamanism, developed by Franco Santoro at the Findhorn Foundation in Northern Scotland since 1999. Its aim is to move beyond our identification with the body, while remaining grounded in our bodies and directing their healing potentials with integrity, spiritual alignment, and clarity of intention. With deep trance work, we share ways of channelling profound passions, releasing blocks that hinder our potentials and celebrating the sacredness of life. Completion of the workshops provides a solid basis for advanced work, enabling participants to continue their practice autonomously, including the option of accessing our certification programme. Clear group agreements are held at all times to create a safe space. Bona Fide Sexuality is holistic and multidimensional sexuality embracing every aspect of life, including physical intimacy and chastity, spirituality and the Divine. It is aimed at unveiling and expanding the awareness of our multidimensional nature, releasing denial and conditioning, while promoting forgiveness with a deep sense of integrity and service. This workshop is designed to promote a gentle acknowledgment and acceptance of your authentic sexuality, no matter how you experience it, etherosexual, homosexual, in a relationship, celibate, and whether you live a chaste life or are asexual. We explore the holistic and spiritual dynamics of sexual energy, as they are playfully portrayed by the astrological archetypes, aligning ourselves with the flow of life, and opening up to new horizons of purpose and harmony. Holistic Awareness is based on the experience that all aspects of life are intimately related and part of the same whole. According to a holistic perspective there is no separation and we can find our sense of purpose only if we acknowledge the wider reality in which we exist. This reality also includes what lies beyond our ordinary perception and can effectively deepen the awareness of which we truly are. Astroshamanism is a holistic system of healing aimed at expanding human perception through the integration of the basic principles of shamanism with experiential astrology, the contemporary revival of archaic mystery traditions and the spirit of the Findhorn Community. These two week offer a uniquely and thorough exposure to holistic shamanic training. Participants in the training will experience practical tools for opening, discovering and supporting the relationship with their essential Intent. They will also focus on releasing blocks and retrieving hidden potentials, and will learn to bring shamanic healing work in their life and relationship with others. The training is designed for newcomers as well as for those who wish to consolidate previous experiences with shamanism or related methods. Completion of the training provides a solid basis for more advanced work. It is also aimed to allow participants to continue their work autonomously with gained clarity and sense of purpose. The training consists of two workshops, which can also be attended independently. This workshop focuses on the clarification of the life Intent and the connection with one’s inner guidance. Participants will be trained in working with holistic techniques for expanding perception and reawakening their authentic purpose. The programme includes: shamanic voyages, AstroshamanicHealing®, trance dance, use of the sacred circle, energy work, rituals and various opportunities for integrating shamanic work with ordinary reality. During this second week participants will experience the whole spectrum of astroshamanic archetypes, retrieving and transforming blocked energies, strengthening the relationship with their multi-dimensional self and Intent. This workshop is designed for people who intend to employ shamanism both for themselves and in their practice with others. The previous week (or another one-week workshop with Franco) is a prerequisite for attendance. Duration: one, two or four weeks. For ages shamans have used dance to reach expanded states of consciousness, connect with ecstatic dimensions, retrieve lost parts, communicate with spirits and bring healing on a planetary and individual level. This training is for those who wish to deepen their practice of trance dance and shamanic sound production. During these weeks we delve into trance dance and drumming according to astrological and natural cycles, creating sacred space, establishing connections with spirit powers, directing and redeploying energies and using them to sponsor major transformational processes. The training is designed for newcomers as well as for those who wish to consolidate previous experiences with astroshamanic trance dance. Completion of the training provides a solid basis for more advanced work. It is also aimed to allow participants to continue their work autonomously with gained clarity and sense of purpose. The training consists of two workshops, which can also be attended independently. In this workshop trance dance and sound are used as transformational tools to open the pathway to expanded states of consciousness and a profound awareness of ourselves and our environment. During the week we employ movement to animate deep emotions and stagnant energies, redirecting them to support highest potentials, empowering authentic visions and stepping into the healing flow that allows us to reshape the world within which we live. The programme also includes astroshamanic chants, planetary alignment dances, sound healing, shape-shifting rituals, and the exploration of the basic astroshamanic drumming method. This week is a special opportunity to experience the transformational effects of shamanic trance dance, music and percussion on the human body, mind and spirit. The workshop aims at unveiling advanced healing applications of trance dance, including the mechanics of holding dance programs and shamanic sound production. This is an intense week specifically designed for those who wish to train in the astroshamanic trance dance healing way with a view to becoming trance dance assistants and facilitators, specialists in shamanic drumming and sound production.